Thank you for choosing to join the newsletter! Please download this FREE Hypnosis MP3 as a thank you. This Mindful Relaxation is the perfect way for you to wind down after a stressful day. 10 wonderful minutes to relax your body and mind, and help you feel more like 'You' again. So Download and enjoy, and do let me know how you get on, keep an eye out for all the other useful info in the newsletter too! 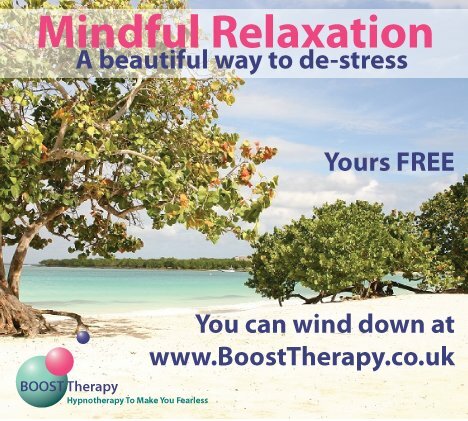 Boost Therapy requires your email address to add you to the newsletter, and also in order to send you a link to the MP3 file to download. General goings on, news & developments at Boost Therapy that you may find useful, or interesting such as new methods of working and trainings that may benefit you and your wellbeing. The email address submitted will be recorded on a MailChimp list, you can, of course, unsubscribe from this anytime. Don’t worry, I hate spam. I won’t share your details. Your details are NEVER sold or passed to third parties.